Take a luxury bus tour in the company of an expert guide to the Royal Monastery and Palace of El Escorial which has UNESCO World Heritage status. Take time to wander round the Basílica and the Garden of the Friars and enhance your trip with a Tour Guide. You will travel to the Royal Monastery and Palace of El Escorial in a luxury bus together with a bilingual guide who will explain and introduce you to the history of Spain's Royals. 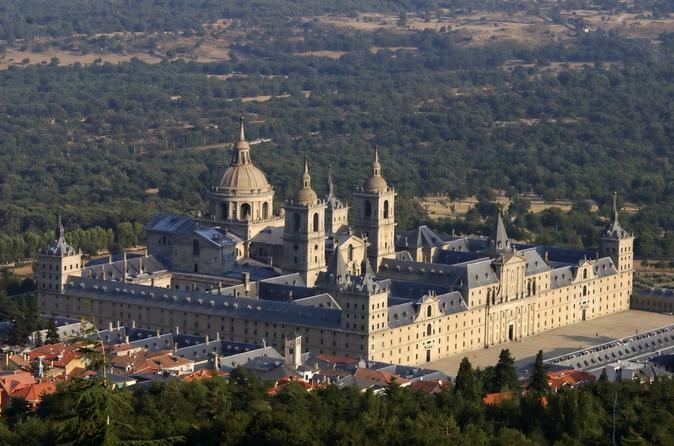 The Royal Monastery and The Palace of El Escorial were designed by King Philip II after the victory of the Battle of San Quentin. It took 21 years to build this huge construction. The incredible location at the foot of the beautiful Sierra Guadarrama mountain range is not accidental: some historians say that the Monastery was inspired by the Temple of Solomon, attributed directly to God. The Royal Monastery and The Palace include the Basílica, the Pantheon of the Kings of Spain, the Library and the Garden of the Friars. The architectural ensemble is completed with the nearby Park and House of Prince Don Carlos with Italian-Style Gardens, arranged in descending terraces, from which you can enjoy one of the most beautiful views of the Monastery.